If you experience pain from Peripheral Neuropathy, you are not alone. It’s very hard to diagnose and it’s even harder to find the right treatment once it is diagnosed. There are many conditions that share similar conditions, such as Fibromyalgia. Sometimes the only way Peripheral Neuropathy is discovered is if the current medication continues to show no signs of relief and further tests are ordered. Advanced Proprietary Blend of Ingredients. To make it even more complicated, Peripheral Neuropathy is not a condition that stands alone. That means that in most cases, the condition and the symptoms are brought on by another condition, such as cancer, kidney failure, diabetes, poor nutrition, alcoholism, or exposures to toxins. Peripheral Neuropathy is a condition that is the end result of nerves that can no longer carry the messages that travel from the brain as well as the spinal cord to the other parts of the body become damaged or consumed in disease. Without this freedom to send messages throughout the body, upper and lower extremities can receive the wrong information, or won’t receive any messages at all. Symptoms of Peripheral Neuropathy will depend on where it originates. There are two other types of neuropathy in addition to Peripheral Neuropathy. Mononeuropathy is damage done to one nerve. This generally occurs as a result of an accident or illness. What happens is simple, there is a prolonged pressure placed on the nerve due to sitting, lying, or putting consistent pressure on that particular nerve. An example of Mononeuropathy is Carpal Tunnel Syndrome. Symptoms that are associated with Mononeuropathy include numbness, pain in the first three fingers on one side of the hand, and tingling. The pain and numbness most likely occurs at night and make it difficult to do certain daily activities such as using a hair brush or hair dryer for a certain amount of time. Most cases of Peripheral Neuropathy falls into the Polyneuropathy category. This condition occurs when several of the nerves located in the body become damaged at the same time. Such factors as alcoholism or being around toxins for a long period of time can cause polyneuropathy. Unfortunately those who suffer from Polyneuropathy lose their ability to feel hot or cold so they burn their hands and fingers more often or are exposed to the elements of cold for an extensive period of time. Because there are so many underlying possibilities that can cause Peripheral Neuropathy, treatment may be extensive. If a condition develops, such as diabetes, then that would have to be treated too. Sometimes treatment can be as easy as simply monitoring your body for any changes. When the development of this condition progresses, then treatment will need to be started as soon as possible. Your pain and the ability to live a normal life is also taken into consideration when determining the treatment plan. Each case is different and should be treated differently. Don’t compare your treatment plan with a plan that you read about in a magazine or the treatment plan that your family member received. Pain relievers, such as over-the-counter anti-inflammatory and Non-Steriod cannot always get rid of the pain. If you suffer from Peripheral Neuropathy, eventually you may need to seek something stronger for pain relief. Trying natural pain relievers first will hopefully eliminate the pain while expressing minimal side effects. There aren’t many options to natural nerve pain relief however one natural supplement is coming in with positive ratings thus far. That natural supplement is magnesium. Choosing magnesium for nerve pain relief is going to be the best place to start. Magnesium is available at many locations and it is affordable so if you want to start on something natural, magnesium may be your answer. You may be wondering how something as simple as Magnesium can help control pain for something like Peripheral Neuropathy. When pain is felt in the body, the brain makes an excessive amount of a chemical called NMDA. While other prescription pain relief medications can cause harmful side effects, Magnesium can settle down the brain naturally and relieve the pain without doing more damage to the body through side effects. Because of the way that foods are now grown, it depletes the magnesium in the foods that are consumed. This depletion can make the pain seem a lot worse. Taking a magnesium supplement can also boost your energy level as well. Any health food store will offer magnesium supplements and they are not very expensive, less than ten cents per capsule. While there, you may also find other natural supplements for nerve pain. Always ask your doctor before taking magnesium if you suffer from a kidney condition. If you have experienced nerve damage due to Peripheral Neuropathy, you may be able to rebuild your system and feel strong again. When you suffer from nerve damage, it can consume you and it can control your day. Taking over-the-counter medications can actually mask the pain and make it possible to function normally for a while but when they wear off, it can be very painful. Taking a B complex supplement can aid in repairing nerve damage and minimizing the pain. Vitamin E has also been traced back to being more of a supplement for pain relief. Another familiar vitamin to aid in nerve damage and pain is gamma-linolenic acid, also known as GLA. Some pain can actually be caused from a lack of Vitamin B Complex. The B vitamins include B6 and B12, both are vital to human growth and development. Patients with diabetes who has suffered some form of nerve damage has benefited from taking the B Complex vitamins on a regular basis. With studies performed on rats, it was proven that vitamin E actually slows down the damage done to nerves as a result of diabetes. It also fights free radicals that can sometimes affect the nerves in the eye and cause damage. Vitamin E can slow decrease the inflammation in the entire body. However, it’s important to note that this is a slow progression and not something that occurs after a week or so of taking this vitamin. Nerve functions are important even if you have no disease or condition that makes it difficult to function in daily life. When you are diagnosed with a condition such as Peripheral Neuropathy, it’s important that you take good care of yourself and include GLA whenever it is possible. GLA is responsible for maintaining nerve function and helps to form the coating of the nerve cells to help protect and maintain. When you consume a diet that includes a lot of sugar, trans-fat, or even alcohol, it can decrease the function of the enzymes that converts to the GLA. Finding the right medication to take for Peripheral Neuropathy can be overwhelming. You have synthetic medication, natural supplements, pain medications, and more. Nerve Renew offers all the B vitamins you will need, B1, B2, B6, and B12. 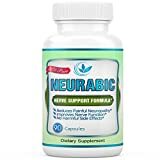 It also offers Vitamin D as well as R-Alpha Lipoic Acid, which is a very effective ingredient needed in pain reduction.Nerve Renew uses a particular form of B1 called Benfotiamine. With Benfotiamine, it is over three times greater than just taking B1 which will help the body absorb is more quickly and become more effective. Nerve Renew’s balance of vitamins allows your body to get more of the B vitamins than any other type of supplement available on the market.Benfotiamine is safe and effective so there are no unnecessary side effects that can cause you to become even more unhealthy and experience more pain. You can read our in-depth review on Nerve Renew here. Best in class, proprietary combination of B vitamins, alpha lipoic acid, vitamin D, and L-Arginine. Better B Vitamins. Highly Bio-Available versions of Vitamin B12 and Vitamin B1. Clinical strength. Compare the ingredient list and serving quantities. Guaranteed relief. Years of research, high quality ingredients and proven results. Formulated to maximize the synergistic benefits of adjunctive Infra Red Light Therapy. Neuropaquell has received a high approval rating for many reasons. It was voted as the best in class pain reliever when it came to adding what is necessary in order to balance the body and become healthy again. It features the B vitamin Complex, vitamin D, L-Arginine, Alpha lipoic acid, and an herb blend. 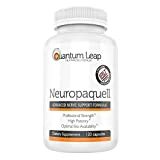 The main reason for taking Neuropaquell is to relieve the tingling, stabbing, and burning sensations felt in the extremities. Neuropaquell comes to you in clinical strength so you don’t have to double the amounts; simply take what is suggested on the bottle. Advanced nerve support formula, safe & effective. Helps Eliminate burning and tingling in your hands and feet that is unbearable. Helping eliminate cold pins/needles tingling numbness sensations on hands, arms, chest, and legs. Nutritional support for sufferers of Neuropathy & other nerve related ailments. HIGHLY bio-available Vitamin B12 (Methylcobalamin) and Vitamin B1 (Benfotiamine). Whether you have been dealing with nerve pain for years or you have been recently diagnosed, this natural supplement can become a part of the overall treatment to keep you moving as much as you can without the tingling pain or the throbbing pain that occurs as a result. People who take this supplement may not feel relief or different within the first thirty days. For some, it takes a little longer to feel results. Helping people who have neuropathy build healthy nerves for over a decade. Safely and effectively experience relief. Exclusive distributor of original formula of the wsn® nerve support formula. Live, one-on-one customer support from real health products. When it comes to nerve health, most don’t treat it until it becomes painful. 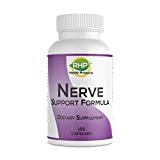 Taking Nerve Support Formula is a great prevention measure because it gives the nerves what it needs in order to be strong and when damage is done to the nerves, it can help strengthen them again. This product may not ease the pain as much as what customers assume when they order it. Everyone is different and results will vary. After realizing that there are other ingredients that could possibly improve the blood flow as well as the mineral supply in the body to prevent nerve damage, the NeuropAWAY was invented. Because this formula is natural, it won’t affect the body in a negative way. The product helps to improve circulation in order to increase movement in the extremities and other areas where the pain is becoming more difficult to live with. Your penetrex purchase & satisfaction is guaranteed by biomax health products Inc. Researched & developed by a renowned chemist in southern California. Penetrex is recommended for use on its own or as a complementary application. If you’re suffering from arthritis, neuropathy, chronic pain, etc. you must try this product. Clients report particularly positive results for soreness and discomfort. 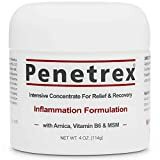 Quick and long lasting Penetrex can give you the relief you need in order to move better. Penetrex focuses on the root of the pain and helps to build on it by relieving the pain that can become impossible to deal with. You can read our in-depth review on Penetrex cream here. Reliefx contains high concentrations of arnica, a powerful anti-inflammatory. Gets deep into your muscles and joints, unlike many other over-the-counter solutions for pain. Improves your range of motion, flexibility, and mobility. Promotes natural relief. Pain relief without any of the unwanted side effects. This pain cream can work well with other pain aids. This rub on cream is also good for nerve pain. ReliefX contains an anti-inflammatory that provides fast relief of pain. Using a cream instead of pills can help target the pain and penetrate the reliever deep into the skin, providing a quick solution to deep tissue pain. Nervana is highly concentrated & starts working within 5 minutes. Lasts for hours. Penetrates deeply – nervana goes to the source to reduce pain, swelling and inflammation. Promotes healing – nervana’s anti-inflammatory ingredients help tissues to heal. Targets all types of pain from somatic to visceral to neuropathic, chronic to acute. Complete guarantee – 365 day money back guarantee. This cream is available for purchase online and can provide hours of pain relief with each application. To use Nervana, determine where the pain is more intense. When the pain is intense, you can rub Nervana directly onto the painful area. Once the cream has disappeared into the skin, it will immediately go to work. Relieve shotting pain. Direct application. 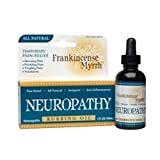 An oil from Frankincense and Myrrh Neuropathy rubbing oil can relieve the prickling pain felt sometimes by Peripheral Neuropathy. This rubbing oil can be applied directly to the location that is experiencing shooting pains, tingling, or numbness. Relief is temporary but so are pills. The most potent topical otc pain reliever on the planet. It does not contain menthol. Restore your range of motion. Sleep better. The anti-inflammatory properties of tea tree oil and eucalyptus are well documented. Outback is mild to the skin and goes to work twice as fast as any pills or supplements. World famous 100% guarantee: if you don’t love it, you’ll get every single penny back. This product stands out among others for a few reasons. 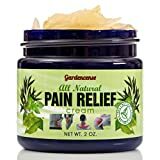 This product is a rub that is used to treat pain and give you some relief while it uses ingredients such as camphor or menthol to create a burning or freezing feeling on your body, waking up the senses. Because it is a rub on with a rub on applicator, it’s easy to target painful areas and feel the relief. 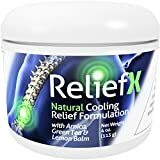 This rub gives you the freedom to move again and works on pain in all the extremities as well as the main places to feel pain; lower back, arms, neck, and shoulders. Lipophilic remedy penetrates deep into skin tissue. Very safe and works to stimulate the body’s natural healing power to ease nerve pain and restore health. When you have severe pain shooting in your arm, down your hands, or in your feet and legs, you want to make sure that the pain goes away and stays gone. With Forces of Nature Nerve Pain Management, pain can be eliminated for a longer period of time. This medication uses medicinal plant extracts to create the best medication for this condition. Nerve Pain Management is able to penetrate deep into the skin and is safe to use. All natural premium ingredients including aloe vera, menthol crystals, and 5 amazing essential oils. Best solution for muscle and joint pain. Cure your pain relief for hours with this premium cream formulation. Finally get the quality of relief your joints and muscles have been craving for. Your satisfaction with Gardencense is always guaranteed. When pain strikes you, it’s hard to say what will be open and if you will need to wait until morning when everything opens to get some relief. An all natural pain relief consists of aloe vera, essential oils and menthol crystals to awake the negativity. This cream can be placed on the area that is hurting you, such as the hands, feet, and more. With this all natural pain relief, you will be able to control your pain more naturally giving you the freedom to handle the pain and live your life. Because it is made from all natural ingredients, there is nothing harmful about using this product long term. With Jarrow Formulas Magnesium optimizer brings a combination of nutrients together to balance your metabolism, aids in nerve and muscle tissue strengthening, and can enhance daily physical activity by supporting the electrolyte levels within the body. Taking one to two capsules of Nerve Reset per day will work with your body to create the relief you need in order to function normally. Having pain with neuropathy can make it difficult to do things you normally do. You need a balanced system that will help your body fight and repair. Nerve Reset can be everything you need it to be. Offers a 90 day money back guarantee, not the usual 30 days. Neuropathy pain relief cream and natural way to provide topical vitamins and nutrients. Odor -free, scientifically established to work. Nervex contains high doses of Vitamin B12 and Vitamin E.
Delivers 30 applications of lotion in protected and measured amounts. 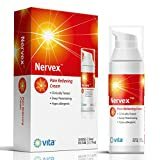 Nervex works to provide vitamins through a topical cream to help your body deal with conditions such as alcoholism, neuropathy, arthritis, and more. Using Nervex to help repair the damage will assist you in restoring your health. Get the nutrients you need with daily use of Nervex. Works to relieve nerve pain that includes stabbing, tingling, throbbing, or shooting. You can purchase creams, ointments, and supplements online at any time. Before making the commitment to purchase something that you assume will ease the pain you are experiencing with Peripheral Neuropathy, it’s important that you read each and ever review located at the bottom of most website pages advertising the lotions, creams, ointments, and supplements. Reading reviews that come from actual people who have used the product is a huge factor in determining if the product is worth trying. The best medication for nerve pain may be found in one of these products. It could be a combination of products, it could very well be the procedures or therapy that the doctor will prescribe along the way. When you suffer from this type of pain, you want to find relief as quickly as possible. It’s important that you don’t become discourage and feel as though this pain will always be felt and there is no way to relieve it. It’s important to note that you should always check the fine print on labels. When you are dealing with pain, it’s hard to overcome it. When you rub on oils or swallow a pill, you want to make sure that it works. If not, how long do you need to wait before taking something else? You will need to know the answer to these questions before you take any supplements. Always ask your doctor if you feel unsure about how a product is made or before you start taking a new product for pain. Your doctor should be aware of what you are taking so he or she can help treat you if you should develop a reaction to something being used. In the end, the pain will be easier to manage if you have a group of supporters that are working together to make sure you succeed. Vitamins, pain medications, creams, and more are available in different stores, through the internet, and through friends and family. Before taking anything, be sure to ask your doctor for advice. If something continues to hurt or if you experience more pain than usual, contact your doctor immediately and stop taking the supplement you are on.